On Saturday August 4, the Denver Outlaws (8-6) headed to Kennesaw State University in Atlanta to face the Atlanta Blaze (7-7) in front of 2,204 fans for what started out to be a “Both teams can move on” to a “Winner takes all”. Due to a rain delay with only 4:58 having been played, the teams were able to see much of the New York Lizards vs. Chesapeake Bayhawks game. 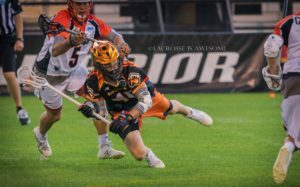 At game time, if Chesapeake was able to defeat the Lizards, both the Outlaws and Blaze would move on taking the third and fourth seed in the 2018 MLL playoffs. With this in mind, Denver seemed to come out of the gate extremely slow with the impression that they were in the playoffs whether they won or not. But as the game progressed at Shuart Stadium, it was obvious that the Lizards wanted into the playoffs and defeated the Bayhawks changing the whole schematic of this game. Atlanta came into the game on a high and a four-game winning streak; while on the other hand, Denver was coming off a two game losing streak. So who had the momentum needed to move on? Denver would finally pump it into gear in the second and not look back as they would defeat the Blaze in the final 60 seconds by the score of 15-14 ending season number three for Atlanta. The Outlaws would start out the first at the 1:17 mark with a nice feed from Matt Kavanagh to Zach Currier (2G) who would score as he leapt up over the stick of Adam Ghitelman. But that would be it for Denver as Atlanta would control the game and the clock for the next 12 minutes. Tommy Palasek (2G) would score unassisted to start the run at the 2:15 mark. Seven minutes came off the board and Atlanta would break it open going on a four goal fun with Christian Cuccinello (3G) getting a nice outlet pass from Kyle McClancy for the transition goal; Kevin Rice (3G) on the man-up situation at 10:35; Scott Ratliff (1-2pt G, 1) off the fast-break from the faceoff win by Joe Nardella would hit a nice two pointer at 10:56; and Jack Korzelius (1G) scoring unassisted at 13:36. Denver would hit net for the final two in the frame as Drew Snider (2G) would get the pass from Wes Berg and with a quick stick-quick finish would break the run. Eric Law (5G) would get his first of five in the contest with a beautiful finish as he came around the back of the next along the crease with a nice change of direction to get it past his defender and Ghitelman at 14:52. Score at the end of the first: Atlanta 6—Denver 3. Atlanta would open up the second increasing their lead with another beauty, this time Rice would hit twine unassisted. He’d hit the bounce shot as Josh Hawkins would set the screen, but Matt Bocklet was too aggressive which allowed Rice to score. Cuccinello would score unassisted as he was left wide open and went high to low scoring on Dillon Ward. If Denver wanted to move on, they needed to kick it in to gear. That’s just what happened as the Outlaws would go on an eight goal run. Veteran Josh Hawkins (2G) would score unassisted back-to-back goals at 5:54 and 12:56. Then about 30 seconds later, the announcement came across that the Lizards had indeed defeated the Bayhawks changing the scenario of this game. No longer would both teams advance. It was now “Do or Die”. Law would hit two more for Denver, the first on the power-play and the second with the assist off the win at “X” by Max Adler who would come off the break, head down the field to a wide open Law who would close out the frame with only one second remaining. Definitely a miscommunication by the Blaze as they weren’t expecting Denver to attempt a shot and weren’t ready. The Outlaws would close out the first half down by one. Score at the end of two: Atlanta 8—Denver 7. At this point, Denver had the momentum and Atlanta needed to breathe and regroup during the break. The Outlaws took their run into the third with Kavanagh (2G) hitting net with unassisted back-to-back goals. The run would put Denver up by one 9-8. Kavanagh’s second goal would be challenged by Atlanta Head Coach Liam Banks. It was thought that while Kavanagh was darting along the end line and bouncing it past Ghitelman, his toe may have touched the line or his elbow hit the ground before the ball passed the plane of the goal. After further review there was no definitive proof showing otherwise, so the goal stood. The stoppage of play didn’t affect Denver as Kylor Bellistri would fire a bullet stepping down and firing it past the left shoulder top corner on Ghitelman. Currier would keep the streak alive hitting a bounce shot as he dodged his man, switched his stick right to left and scored his second of the game. Rice would hit the lone goal for Atlanta in the third breaking the eight goal run by Denver bouncing it past Ward on the outside at 7:05. Justin Pennington set a nice pick allowing Rice to notch his hat-trick on the night. But the celebration was short lived as Denver would score twice before the buzzer sounded with Snider and Bellistri both finding twine. Score at the end of three: Denver 13—Atlanta 9. The time had come for Atlanta to lock it in or end their season. They would outscore the Outlaws in the fourth 5-2, with Cuccinello hitting his second unassisted goal and third on the night at 1:57 as he powered past his defender hitting top corner; Daniel Eipp (1G) would get the fast break, head toward the net dodged around Eli Gobrecht, jumped over Matt Bocklet and hit net. Connor Kelly would be the next to keep the run alive. Palasek would feed the ball to Kelly and with no one covering the crease, Denver left the lane wide open for Kelly to hit net bringing the Blaze to within one 12-13. But Denver had the momentum and the experience of having played many times to advance to postseason. Law would hit his fourth and fifth of the game and his 40th of the year. The second was an exciting goal as Denver was on a man-down situation, Nicholas Tintle would get the turnover, pass to Law who was left wide open in front of the crease and he’d sink in what was thought to be the final blow. Denver was up by two with 3:13 left in regulation. The Blaze weren’t going out without a fight. Palasek would score unassisted as he spun on the end line and on the door step dodged scoring with 2:15 left. Atlanta would get possession with the last 60 seconds on the clock, but wasted a lot of time passing the ball instead of setting up the shot. Rookie Connor Kelly was almost the hero of the game as he would set up outside the two-point arc line sending a shot between the sticks of Michael Simon and Gobrecht with 29 seconds remaining. What he didn’t realize was that when he stepped forward and fired the shot, his foot would come down on the arc line giving him a one-point goal instead of two which would have tied the game. A rookie mistake and one that Kelly will not soon forget. Denver would win the final face-off and control the ball for the last seconds of the game sending them into post-season for the 12th time in their 13 year franchise history. Final Score: Denver 15—Atlanta 14. It looks like Denver will face the Chesapeake Bayhawks in Annapolis at Navy Marine Corps Memorial Stadium. The Outlaws have had a rough year against the Bayhawks, losing both contests by two goals. Will the Bayhawks advance to the Championship game on August 18 or will Denver go onto fight for the Steinfeld Trophy?